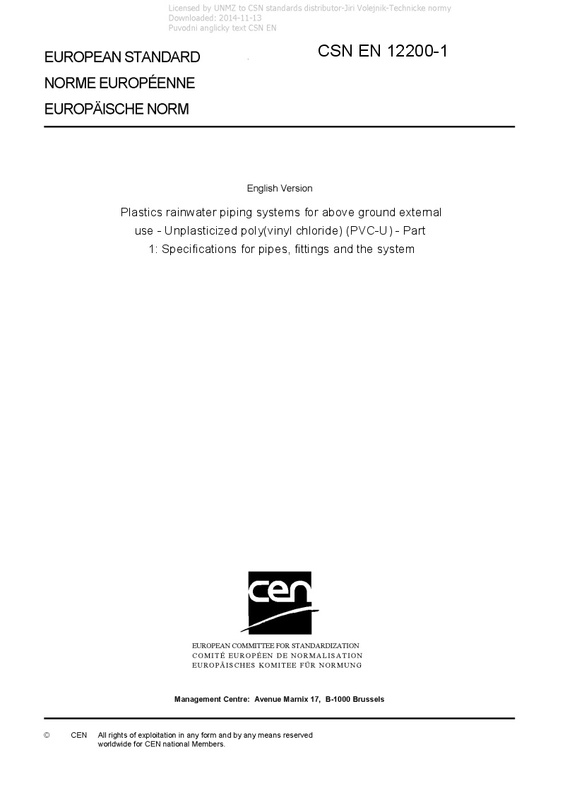 EN 12200-1 Plastics rainwater piping systems for above ground external use - Unplasticized poly(vinyl chloride) (PVC-U) - Part 1: Specifications for pipes, fittings and the system - This European Standard specifies the requirements for pipes, fittings, brackets and the system of unplasticized poly(vinyl chloride) (PVC-U) intended for use as above-ground external rainwater piping systems. It also specifies: a) The requirements for metallic brackets. b) Both solid wall pipes and fittings, (i.e. product manufactured from a single layer), as well as solid wall multi-layer pipes. c) The test parameters for the test methods referred to in this standard. Pipes can be used in conjunction with fittings and brackets of acrylic materials provided these polymers meet the performance requirements of this standard. The products are usually used in conjunction with gutters conforming to EN 607 . They are not intended for use with products conforming to EN 612 . This standard is applicable to PVC-U rainwater systems of circular, square, rectangular or any other shape with sealed (rubber ring or solvent cement) or unsealed joints. This standard covers a range of pipes and fittings sizes. NOTE 1 It is the responsibility of the purchaser or specifier to make the appropriate selections from the size range to take into account their particular requirements and any relevant national regulations and installation practices or codes. NOTE 2 The term "rainwater" in this standard is used also to encompass "surface water" (as defined in EN 752 ) run-off from buildings.